Imagine a Spanish politician unlucky or unwitting enough to run under the banner of Prime Minister Mariano Rajoy’s Partido Popular (PP) in the upcoming regional elections in Catalonia. The answer is an unqualified no: The Spanish haven’t been this miserable since the Spanish Civil War. 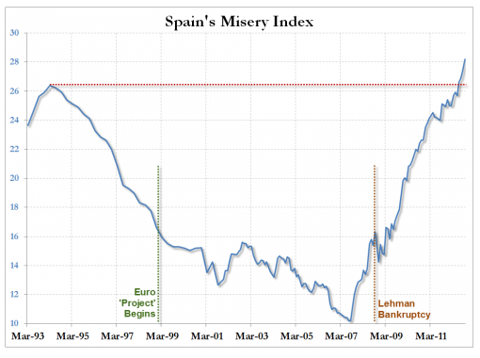 At 26.44%, Spain’s Misery Index exceeds that of Greece. The Misery Index of Spain’s youth now sits at 54%.